ESP version of Discraft’s slightly overstable Avenger. Good for power throwers and upwind drives. The Avenger is a maximum distance driver that can be used by ams and pros alike, and helped Nate Doss to win the 2005 Pro World Championships. You can throw it anhyzer and it will slowly fade back to a hyzer. Throw it flat and it holds a super straight, extra long flight line. I use the Avenger a lot for long range, stable drives. I can really reach back and throw this one hard with confidence, and it goes a mile. If you’re facing light to moderate headwinds, I would highly recommend the Avenger. The Avenger has taken over in my bag for most shots out on the course. My distance ranges from 375 – 400 feet with the Avenger. I reach for it for most long distance shots, whether it be wide open or in the woods for touch shots. Pick one up and you will be buying a stack! The Z Avenger complements my X Avenger because it has a more reliable flight character in moderate to hard headwinds. 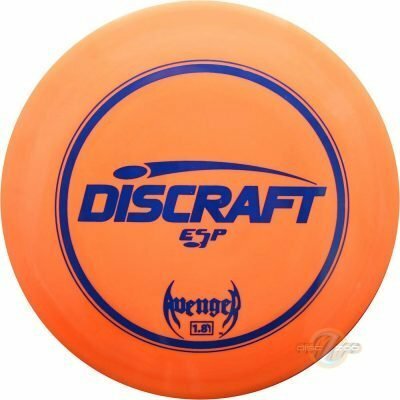 I will not get the same soft glide with it, but that’s not the purpose of this disc. The Avenger IS my go-to disc. The consistency and distance are undeniable, this disc makes the magic happen. Beat it in for a month and it’s bread and butter! Avenger could be the best driver ever made.